Filling Range 10 to 100gm. The manual filling machine is specially designed by our factory for medium or small size enterprises,laboratory,hospital or beauty parlor in daily use chemical section. Its cofiguration.is compact,acts agility and easy to use,all the parts which dip in the materiael are made of stainless steel and polytetrafluorethylene. 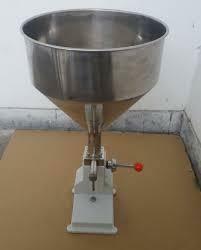 Looking for Paste Filling Machine ?